We all love being able to cling on to the summer nights with the help of some extra heat outside. If you want to give the temperatures a boost, then some form of additional warmth is essential. You’ve had a little look at fire pits but the idea of all that smoke and manual work is not taking your fancy, so what is the alternative? Garden patio heaters use either gas or electric to work rather than actual fire, which is safer and cleaner. They can be freestanding, wall mounted, small enough to sit on your table or even hanging or attached to a large parasol. Style over substance is a term regularly used when reviewing appliances, but we are happy to say that this tabletop electric patio heater has both in abundance. It uses infrared technology to heat the immediate area and radiating body as opposed to losing the heat to the air. The silver aluminium upper also attracts the heat, and the stainless steel body keeps the rust at bay. 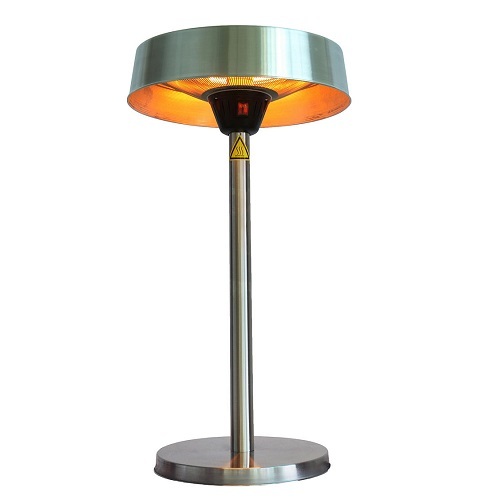 In terms of the power heat output, it is on par with (if not slightly better than) a lot of the large freestanding patio heaters, which is great if you want a lamp which you can really feel the benefits of. The light it gives off is really warm-tinted too, adding to the atmosphere. All you do is plug it in, and the heat is available almost immediately. It is designed for tables, but there would be nothing to stop you setting it on the floor – that is how good the heat is. It is completely slimline so takes up little room, and tall enough to allow you to carry on eating/drinking without the fear of knocking it over. Price-wise, it may look steep, especially when compared to some freestanding models we have reviewed, but we can say that it seems perfectly in line with the added amount of heat it gives out and the overall design and look. Plus, it feels one of the sturdiest so we have no doubt you could get years of use out of it if you look after it correctly. Definitely worth the investment now. Our pick for the best table top electric patio heater money can buy - there is style, heat and plenty of efficiency. We love Andrew James appliances here at Appliance Reviewer, and this patio heater is no different. Most definitely one of the most stylish on the list, its practicalities also go way beyond just heating your outdoor area. An adjustable floating table surrounds the central pillar, which is perfect if you are entertaining and need a little bit of extra storage space. It is completely removable if you wish, too. The entire light is made from brushed stainless steel for an elegant finish, and the upper dome lid is curved to capture all of the heat so none will escape out of the side. You also can adjust the height of the pillar from 1.6m to a maximum height of 2.1m. So, if you’re sat around the outdoor table or just having a coffee, you can lower it for a more direct heat source. If it is nearer the top, it will cover an area around 16m2. Double halogen bulbs both have up to 5,000 hours of life, and they’re more economical to run than gas options. They heat up quickly and preserve energy by working together for the setting you want. The lowest setting is just the 900W bulb, the medium is the 1200W bulb, or they can both combine for the maximum 2100W of heat. The price is also very generous, considering the effectiveness, style and ease of use. Definitely one of the best electric patio heaters you can purchase. The addition of the extra table and the flexibility in catering to your party makes it a solid choice for any back garden. Whether you have a covered balcony, pergola or gazebo, a hanging heater is a great way to save some space but allow the heat to radiate downwards onto your seating area. The carbon fibre elements heat rapidly, so you’re ready to go straight away, and there is no waiting around trying to ignite it or wait until it gets up to temperature. Made from stainless steel and finished in a grey colour, it isn’t only durable but will fit into any outdoor space with ease. The lead is 1.9m long, and it has to be plugged in as opposed to hardwired, so we would say it is only really suitable for anyone with an outdoor socket near their entertainment area. It isn’t completely waterproof, with an IP24 outer coating which protects it from light splashes. But as it is only meant to go under a covered area anyway, this shouldn’t be a problem. The elements have an overall running time of around 5,000 hours which should be plenty for the summer months without having to replace them. Running costs are on average 22p per hour on the maximum setting so it won’t make too much of a dent on the bills either. The heat output is only 1.5kW, so it isn’t going to keep you warm in arctic conditions, but will be enough to take the edge off on cooler summer evenings. It is stylish, easy to fit and gives out just enough heat to keep you going for an extra hour or two - worth the money. Another option from Firefly, and just as good as their tabletop offering. Thanks to the three power settings, this heater can be used any time of the year and give out just the right amount of warmth for the conditions. The infrared heating elements don’t only give out a great amount of heat, but they also give out enough light to add to the atmosphere. Unlike gas heaters, this one can be used both outdoors and indoors if you have a conservatory or outbuilding. It doesn’t give off any smell or fumes, and is cheap to run so could save you from switching the heating on. The amount of heat it gives out isn’t as grand as with gas heaters, which is to be expected with an electric model but is enough to take the chill off the evening. If it were to be used under a gazebo, we think it would feel a lot warmer. Regarding safety, there is overheat protection and a heavy base design for extra stability, so it is less likely to be knocked over or fall because of wind. Construction does feel a bit flimsy though, so we wouldn’t rely on these alone and would still keep an eye on it. The cost is low for an outdoor heater, and this is reflected in some aspects of the quality and assembly, but if you’re after an affordable option to keep a sheltered area a bit warmer then it is a good choice. If electric is the power choice for you, then this Firefly model from Primrose performs just as well as the tabletop counterpart and looks pretty good too. Wall heaters are great for directing heat but also saving space and keeping the area a bit more hazard-free, and this one is a solid choice in terms of heat output, price and flexibility. It can be tilted up and down 45-degrees, so you have a bit more choice in terms of where it is positioned and your needs. There is a waterproof rating of IPX4, which keeps it safe from splashes of water but the manufacturers still say it should be under a cover at all times, such as an awning, or at least covered when not in use. They state it can also be used indoors as well as outdoors, so if you have a conservatory or outbuilding you want to make use of when the weather gets cooler but don’t want to turn the central heating on just for one room, it is ideal. Not only is it a budget offering, but it is also cheap to run too, even on the highest setting. The three quartz heating elements have an average lifespan of over 5,000 hours, so won’t need regularly replacing to further keep costs down. They’re also silent and safe. Setting it up is easy, as it just needs fastening to the wall and plugging in. We liked the little pull cord, which allowed it to be turned on and off without going to the mains supply. Because it is wall mounted, it is more likely to be sheltered so there is a high probability it won’t be as affected by the wind as upright freestanding models, but this all depends on your garden set up. For the price, it is worth a go. Easy to fit and will make staying outside for a bit longer a lot more bearable, as long as you get the positioning right. Whether you’re having a barbecue, birthday party or just want to make the most of the nice weather by dining Al Fresco, a patio heater can help take the chill off, and this one is a great option. The height is adjustable between 174.5cm and the maximum 210cm, so you can keep it more directed at a low level or above the table to keep the entire area warm. You can also tilt the head of the heater 45° up or down for a bit of extra direction. It is suitable for use both indoors and outdoors, so can be moved from the garden onto decking or under a gazebo, and taken into a garage or summer house if you have to give in and move indoors eventually. The 3m long power lead means it is pretty flexible in terms of positioning too. There is a heavy weighted base for stability, and over-heat protection will help you relax knowing that it can sort itself out if there are any problems. Heat-up time is quick, and just a matter of turning it on at the mains which is great for any last-minute plans. The quartz tube elements have an average lifespan of up to 2,500 hours, and it should cover an area of around 15m2 comfortably. Once it is all set up and running, there is a good amount of heat and the three different heat levels is handy. Featuring a black rattan design, so it works well with the rest of your furniture and is well protected from the elements, this Firefly table heater will keep you cosy without having to grab everything and move the party inside. The three settings – 900W, 1200W and 2100W – allow you to set the heat depending on how you are feeling, whether you need it just to add a bit of a boost or you really need to feel the heat. The maximum setting will warm an area of around 9m2, which should be enough for a dining table when entertaining. An IP44 rating meant the lamp is water resistant, so won’t be damaged by a few splashes of water (but you’ll still have to store it away and cover up when not in use). It can be used both indoors and out, though, so you don’t have to resign it to the depths of your garage when the weather outside is too cold to use it as it is still perfect for a conservatory or orangery. It feels very stable, with some little plastic spacers on the bottom to protect your table surface. The base is broader than the top as well, which makes it feel like it would be hard to tip over should the table be knocked or a sudden gust of wind arrives. We will say it is a lot bigger than it looks in the pictures so make sure your table will be able to accommodate it. We see no reason why it couldn’t also be used on the floor if you were not near a table. The rattan base is definitely the selling point if looks are a focus for you, but it is a bonus that is works very well too. Parasol heaters not only save space, but they’re usually pretty easy to fit in place too and can be stored away or moved with ease, making them a popular choice. This model from Outsunny gives out a generous amount of heat, as well as being flexible enough to cater to your own heating needs. Every blade light is adjustable 90° vertically, so you can target the heat more towards your party or pop them completely down for storage once they are cool. There are switches on the side of the fan’s base to make it easier to turn on and off, and each blade is controlled with a different switch so you can adjust the heat intensity with no effort depending on the sudden changes in temperature. Any parasol pole is suitable, up to a 60mm diameter, as you can simply tighten it as much as it needs to go. The yellow-orange light it emits is bright enough to use as an outdoor light if it is starting to go dark, too. It will cover an area of around 9-10m2 when all three of the lights are on, although when they are right at the top of the umbrella the heat is not great so we had to move it lower down the pole to feel the benefits. In terms of parasol heaters, it is one of the cheapest on offer that is still worth purchasing, even though it isn’t the best heat. Definitely only for those little boosts in the evening, but still beneficial. Outdoor spaces are precious. They allow you to entertain, make the most of the nice weather and get some much needed fresh air. But in the evenings, things can get chilly. Amazon is a force to be reckoned with thanks to their AmazonBasics range, and this patio heater is a fine example. It is powerful and gives out a great level of warmth to ensure guests are comfortable. Stability is great, because the base reservoir system can be filled with water or sand. Ignition is simple thanks to the Piezo system. Pick low or high heat settings, and turn it off completely at the end of the night. It can heat up to 18 feet in diameter, so will make a big difference to your evening. It is a great alternative to a fire pit as there is no smoke, debris or fire to contend with. This makes for a safer and cleaner environment. There are two wheels on the back if you want to transport it from one end of the patio to the other or bring it out from storage. You won’t have to contend with heavy weights or damaging the base. As expected, it is a great price and instructions are good and clear from the perspective of the user. Our only bit of advice would be to use a maximum 11kg gas bottle and bear in mind the dimensions – the most common 13kg ones didn’t fit. Able to work with propane, butane or LPG gas, this tube real flame heater is a great option for anyone who needs a real boost of heat to extend the warmer months. Not only can you actually feel the heat, but the added look of the real flame effect gives the illusion of warmth too, which makes it a great addition to any garden. The gas bottles sit well out of harm’s way under the heater, so can’t be knocked over and won’t ruin the look. If the actual heater is knocked over, a safety switch will immediately knock the flame out to prevent any accidents or burns. Putting it together is quite straightforward, and once you get past taking all of the protective coverings off then you’re pretty much most of the way there! Don’t be put off by all of the flat pack parts, as its worth it in the end. It may be a bit more than a lot of other gas patio heaters, but the whole design and different approach makes it pretty worthwhile. It comes with the regulator so as long as you have the gas, you’re good to go. Once you get past the setup, this is a heater which gives out a good amount of heat. Some gas options advertise high outputs but then let you down when the temperature outside is dipping. We think you'd be safe with this one. A big selling point of this particular model is the adjustable heat focus reflector, so if you’re only sat at one end of the table or in one area, you can direct all of the heat towards you rather than wasting some. You could even turn the heat down and save a bit of extra gas this way. The gas tanks are stored within the base of the heater and clasped shut for added safety and security. This also keeps it looking sleek and gets rid of the issue of wires and tubes being on show. There is an anti-tilt switch and a flame failure safety device so you can relax while it is in use. Thanks to the weighted base, it is unlikely to tip over or be knocked. There are also wheels at one side for easier mobility. We also loved that the top of the base is flat, so could be used as a bit of an extra table when entertaining. The oven baked powder coating will keep it protected against the elements and won’t wear down easily. Heat output is one of the highest for a heater of its kind and should keep a group happy enough for the evening. The price is a bit higher than most other lamps of its type, but the tilting mechanism may sway you to splash out. The option to direct the heat makes this an obvious winner, and the amount of money you save on gas bottles will probably make up for the slightly higher than usual price tag. For something that looks a little less like a lamppost and is small without losing power, this Bullet model from Fire Mountain is the perfect modern touch to any garden. Made from stainless steel, it has kept its natural sleek silver colouring for an up-to-date look. It is just over half the size of most other freestanding models, so if you hate the idea of a large towering heater hanging over you when you’re entertaining, or you simply want to store it away when not in use, then this is for you. The smaller, more robust shape means it is unlikely to be knocked over, but if it is then the safety switch cut out will keep you safe. A piezo battery ignition makes things easier and quicker, and you can choose the perfect heat setting between 5,000W and 13,000W. A free 27mm gas regulator is included, and even though the Bullet works with both propane and butane, the regulator is for propane so we would recommend keeping using this. It is also for canisters with a valve at the top, so take this into consideration before you buy. The door for the gas canister compartment closes and clips shut to keep everything looking tidy and safe. The dimensions of an 11 or 13 kg canister are usually the same in the UK, and they both fit snugly (50cm high and 35cm diameter), but this is just about the limit so you can’t get a large canister in there. Price wise, it is over double some of the others on offer, but if you’re all about buying focal points rather than eyesores, then this is one of the best designs out there. The heat it gives out is great, so it isn’t just looks you are paying for. Stylish and compact yet packs out a whole lot of heat - great if you want something subtle yet characterful. The small version of Kingfisher’s PHEATER1 freestanding patio heater, this tabletop model will keep everybody warm surprisingly well. A plus of a tabletop heater is that you can pop it away when it isn’t in use rather than having to take a chance and keep it outside exposed to the elements, but you don’t want this to get in the way of an effective product. Thankfully, this model gave off enough heat to keep a large table of six people plenty warm enough. It can run on both propane and butane, as with most other gas models. However, propane is recommended as it works better in lower temperatures, so we would follow this advice. You also have to buy a regulator separately, appropriate to the type of gas you use. The supply pipe is generous in length (around 2m), so you can pop the canister out of harm’s way without straining the hose or making it a safety hazard. It can also fit through a parasol hole in a table which will keep it tucked away. It seems heavy enough to stay in place without having to clamp it down or prop it up, even when it is windy. The material is sturdy, and we don’t think it would rust or tarnish very easily so would be a great long-term buy. The price is about right when compared to others and the freestanding versions, especially for the heat you get and freedom of placement and storage. 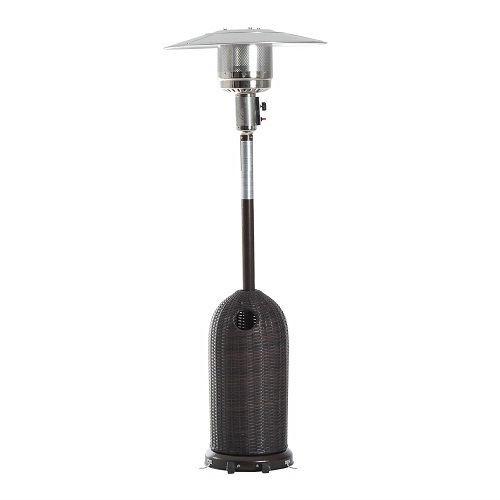 If your garden is decked out with brown/black rattan furniture, then this patio heater will be the perfect companion. It is made from a metal frame, covered with the rattan for a true outdoor garden design. The upper is stainless steel, which reflects the heat well and also keeps it looking good and strong no matter the weather and day-to-day effects. There are all of the usual selling and safety points, too. A tip-over switch will prevent it from staying on if it happens to fall over, and wheels on the base will allow you to move it around the garden or pop it in storage. Igniting it the first few times is a long process. Instructions state you need to hold the ignition down for around 2 minutes to clear the air from the pipes, but it took us over 5 minutes, and similar times the next two lightings too. Once it does get going though, the heat given out is really sufficient to warm an area around 5M³ in size. The price is about average for items of its type, but thanks to the more garden-friendly design and the fact it’ll happily blend in no matter the look of your other furniture, we would say it is definitely one of our top choices. Once it is lit and firing away, the amount of heat given out is good and the rattan and curved base means it will slot perfectly into any garden. The two major things you have to consider are how much area you would have to heat, as well as which power source is best for you to use. If you have an outdoor electricity point, then electric is a great bet. If not, but you’re happy to have an extension lead running into your home, then it is still a strong possibility. Should you have a large area to keep warm, then a gas option may be best, but make sure you could have access to (and afford) a steady supply of bottles or refills. If you will likely have a lot of kids or pets running about, you will also have to think about the logistics. Will wires be okay, or is a gas bottle tucked out of the way in the base better? Are you happy to have gas? Regarding the style, you would have to ensure you have the space and freedom to fit wall mounted heaters/hanging or parasol models. They are great options to save space, but not quite as adaptable. If you are set on a gas option, then this is the second choice you have to make. Natural gas will connect up to the gas line in your home, so is a bit more of a permanent and reliable method, but propane/butane bottles offer more portability, and there won’t be any gas extension hoses involved. Natural gas also needs installation from a professional, which could be costly. Bottles will also need to be refilled or repurchased. All of those we have featured are propane or butane powered, as it is the most common choice of the options and is seen to perform best in colder weather. One thing you will have to bear in mind is the gas regulator. Most aren’t included with the heater but are essential to get it working. The red ones work with propane and blue with butane, and they aren’t adaptable. They should only cost around £10, but you’ll have to decide on your preferred type of gas before buying. Electric heaters are usually more expensive than their gas counterparts. However, the prices are quite balanced with those we have reviewed. A freestanding model can generally set you back over £100 to £200, with table versions usually costing anywhere between £50 and £100. The average gas heater costs £1.20ph to run, but an electric patio heater can be just 15% of this. The latter depends on the price of your electricity and tariff, but most with halogen bulbs are only around 20p for an hour. Patio heaters can’t be left out in the rain as it will damage the elements or ignition. If they have to be left outside, ensure you purchase an additional cover which will keep it sealed, and try to move it to a sheltered area away from the wind in case it becomes damaged. Smaller heaters can be moved into storage in a garage or shed, and covered to prevent it from getting dusty or damaged. If you choose an electric model, some are appropriate for use inside – check the manual first and take precautions. Rather than blowing hot air into the space, patio heaters emit radiant heat. Simply put, they warm the objects around them rather than the air molecules. Most use shortwave infrared waves to give out a large, stronger amount of heat in a small space. Unlike convection heaters which are used in the home, such as radiators, they don’t require air to travel through. The heat just travels until it comes into contact with a solid surface – in the same way you feel the heat from a fire in the cold, or the heat from the sun even on a chilly day. All models must have fundamental safety aspects built in, such as tilt shut off valves and switches to prevent it from staying on if it falls over. These can extinguish flames or stop the electricity supply. Always ensure you read the instructions clearly and leave enough clearance between the heater and any flammable objects, such as gazebos, trees or wires. They should only be placed on flat, stable surfaces which won’t move or shake. Despite the safety aspects, you should never leave a patio heater unattended. How Many Patio Heaters Will I Need For My Garden? Most 2kW heaters will offer a heating area of around 9sqm. This is the level at which an electric patio heater usually sits, so if you need a larger area covering or a more intense heat, a gas option may be best. Tabletop heaters may be better than freestanding if you want to concentrate the heat more, as they are usually closer to objects. Bare in mind conditions such as wind, which has an adverse effect on the level of heat you will feel. 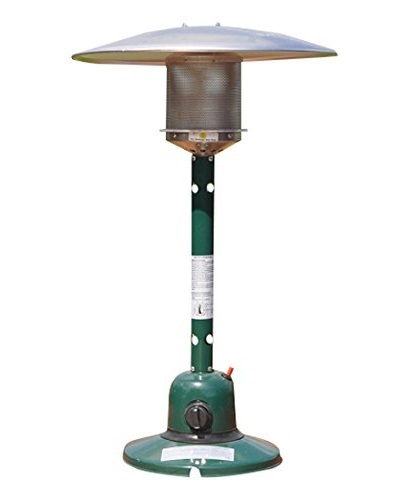 Which Is The Greenest Form Of Patio Heater? They all use energy, but according to experts, gas is the least economical form of fuel for your patio heater. It can be costly and creates more waste than electric. You would have to keep stocked up on gas, too. Electric heaters are seen as getting warmer quicker, which could cut the length needed to keep it on before you feel the benefit, but they don’t cover as much area so you could need more.